Halloween has always been a favorite holiday of mine. Something about the fall season, the cooler weather, leaves changing colors and jack-o-lanterns lighting up the neighborhood houses has just the right amount of spooky. As I got older the horror movie genre became a guilty pleasure and then visiting local haunted house attractions and hay rides was a must each year. Then about 15 years ago I visited Florida during October and saw commercials in my hotel room about Universal Studios Halloween Horror Nights. It looked amazing and I knew I had to squeeze it into my vacation plans. To this day that was one of the greatest Halloween events I have ever been to. Since relocating to Florida this was something I wanted to revisit as soon as possible. Our daughters are a little too young for this as it can be pretty scary even for adults. But my wife was interested in going so we got some tickets and a babysitter so we could head over and check it out. 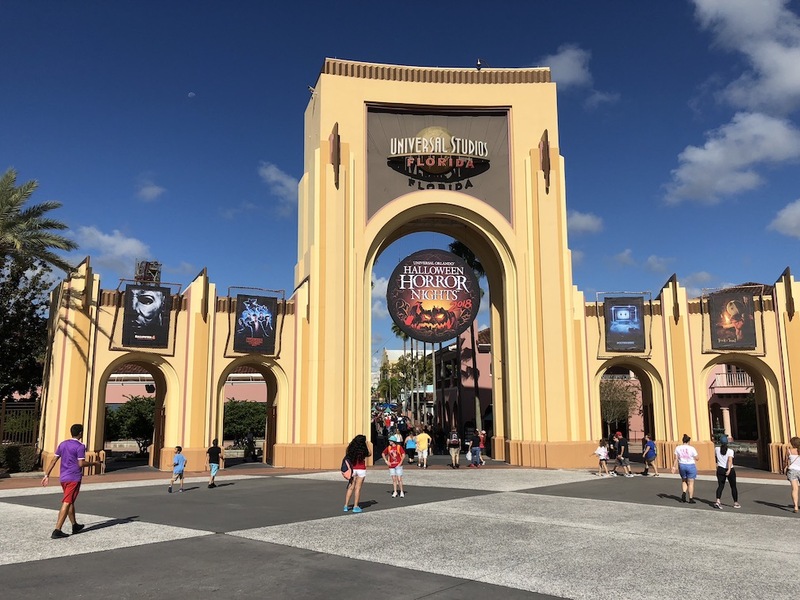 Above is a picture I took of the Universal arches about a week before we actually went to HHN (Halloween Horror Nights). Above is a picture I took of the line we were in the middle of just to try and get into the event. It usually starts sometime between 6-6:30pm. This was taken around 6pm and it took almost an hour to actually get inside the park. Once inside, since it hadn’t gotten dark yet I wanted to check out the souvenirs first and see what they had to offer. 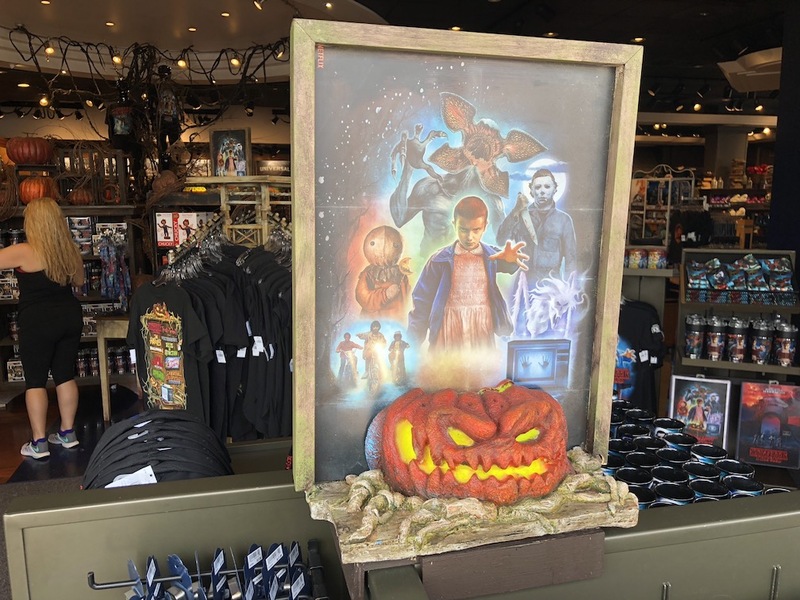 The logo for this years HHN included the above creepy disfigured pumpkin and it could be found all throughout the park. 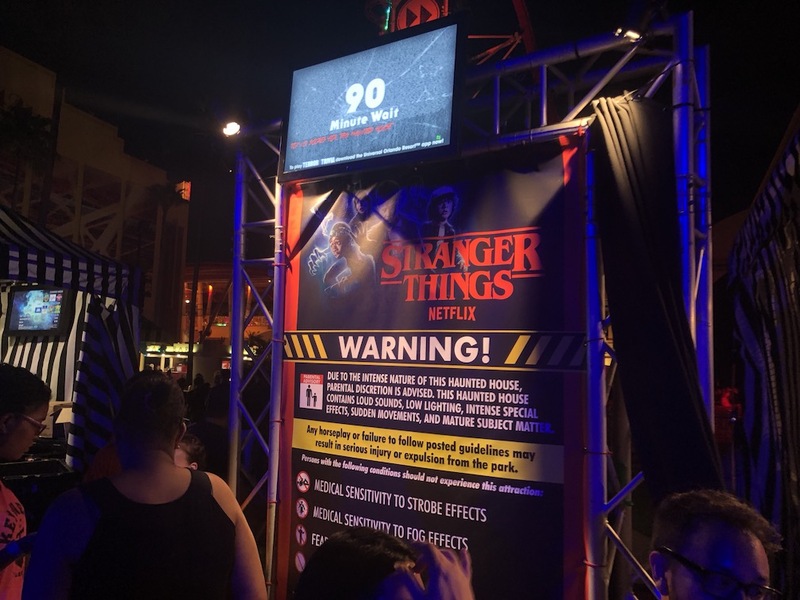 As you can also see one of the HHN houses this year was themed around the popular Netflix show Stranger Things and there was a ton of merchandise with that on it. In the middle of the Universal Studios Store was a collection of vintage arcade games. Including Pac-man, Asteroids, Donkey Kong and some other popular games. Now these machines do not take quarters, but instead can only accept special tokens. 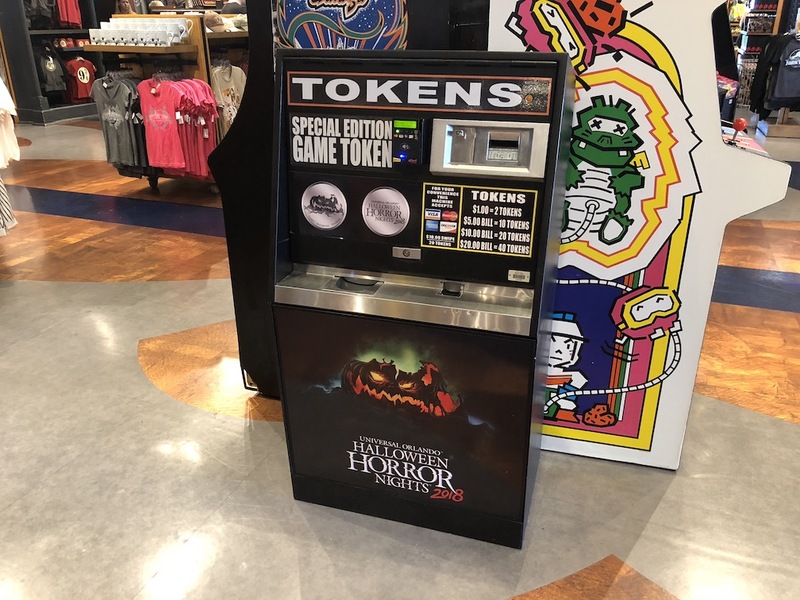 The above machine is where you can purchase those tokens. They were $1 for 2 tokens or discounts if you bought in larger quantities. Being a pressed penny collector I obviously wished these designs were in a pressed penny format, but I was still happy to see these special tokens. 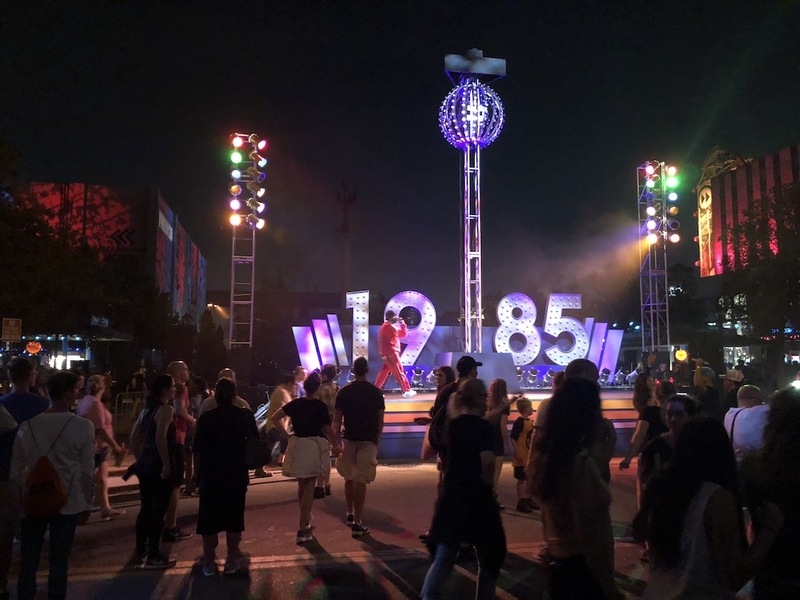 This is something I always wished Disney would do for their events and parties. I didn’t want to spend time playing the arcade games (although it was tempting) but I did pick up a few of these tokens for my collection. 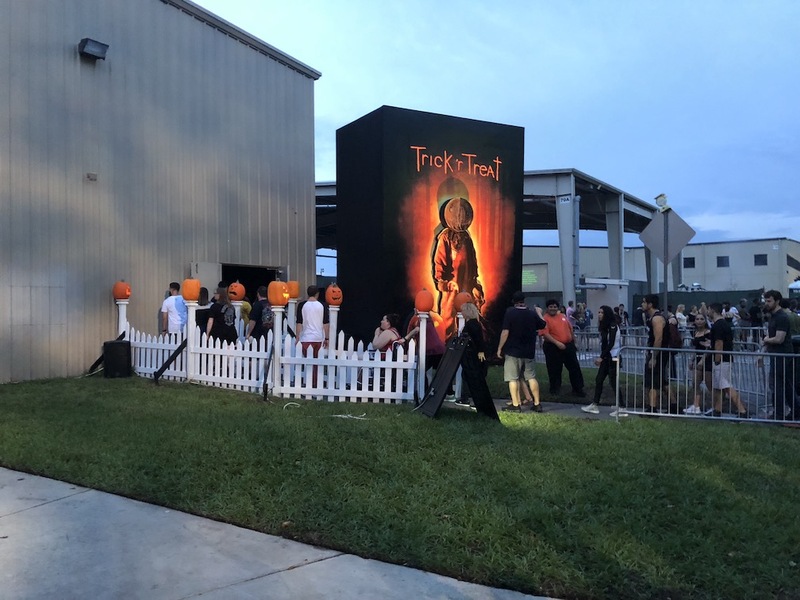 They had the creepy pumpkin on one side, and the HHN 2018 logo on the other. It was now starting to get a little dark out and we met up with some family friends to head over to our first haunted house. Our strategy because of the huge crowd for this event was to visit the houses at the back of the park first and then move towards the front. 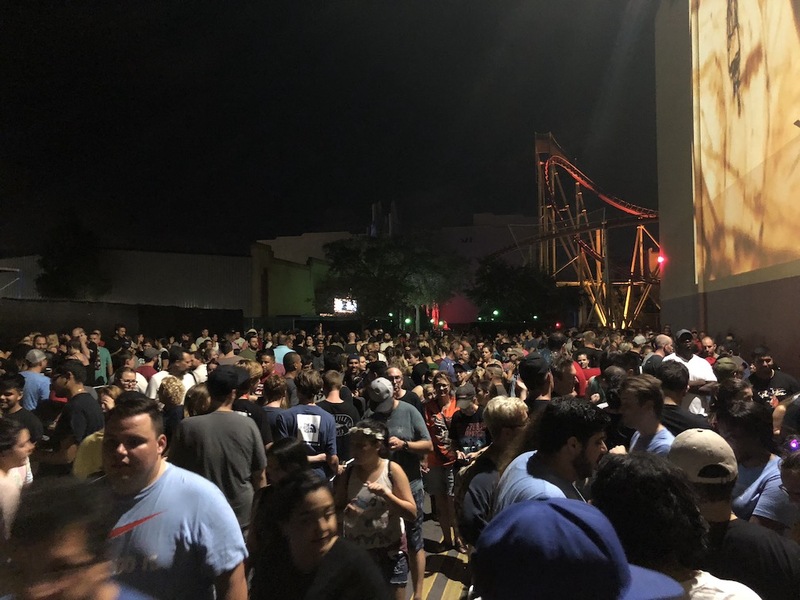 This seemed legitimate in theory but seems lots of other guests has the same idea. First up we visited the Trick ‘r Treat house which is themed around the cult classic movie of the same name. 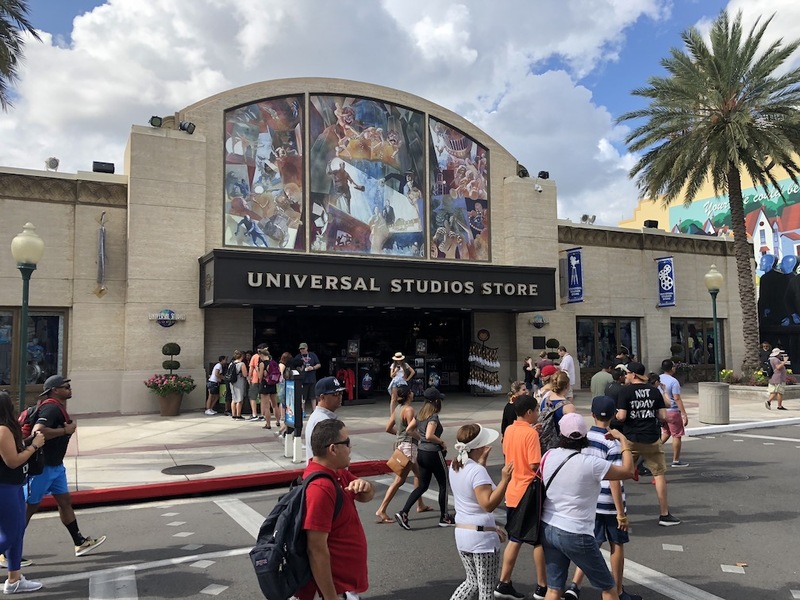 Unfortunately for the safety of the guests and scare actors there is no video or photography allowed inside the houses. If you are interested there are plenty of “media preview” videos inside the houses on YouTube. The detail inside these houses is really amazing, and with Universal behind the make up and costumes you really get sucked into the houses. The pathway weaves around sharp corners and through narrow hallways with the scare actors jumping out at you every few feet. They are not allowed to intentionally touch or grab you, and it all makes for an amazing adventure. The second house we visited was called Seeds of Extinction. This is an original house theme based in a post-apocalyptic wasteland overgrown with invasive vegetation. Basically scary plant creatures jump out at you as you walk through the house. 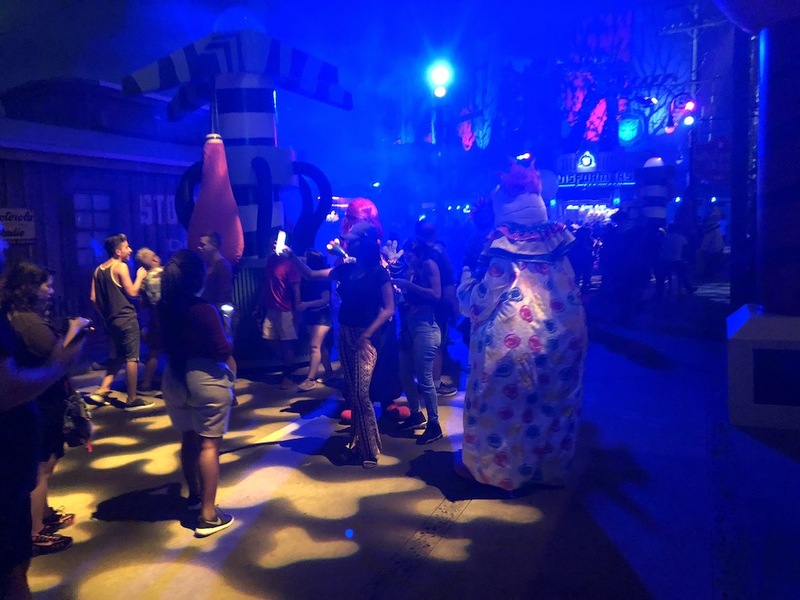 In between the houses along the main walkways are areas called Scare Zones. Some of these are IP (intellectual Properties) or original theme zones just like the houses. 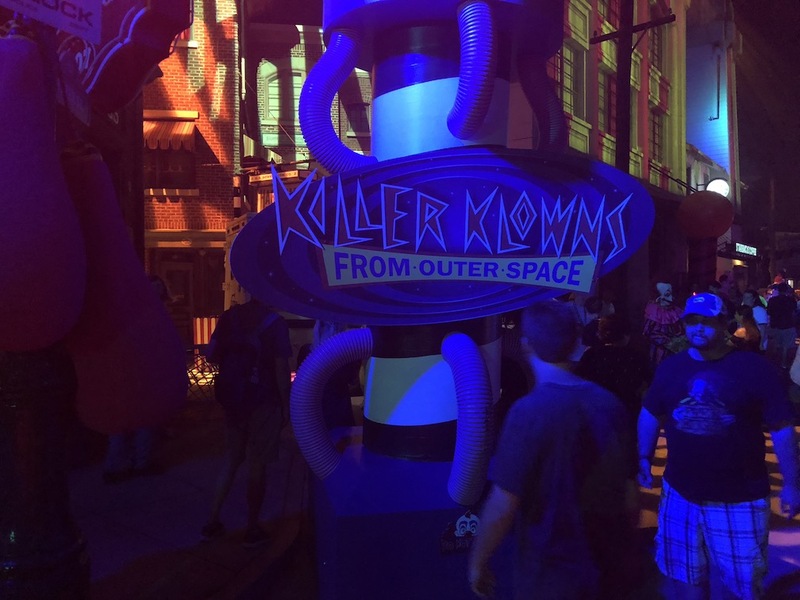 One of the more popular scare zones was the Killer Knows from Outer Space zone. The uber creepy clowns just slowly stalk around you as you try to get through to the next house. The fog, and lighting in these areas really add to the ambiance and creepiness factor. 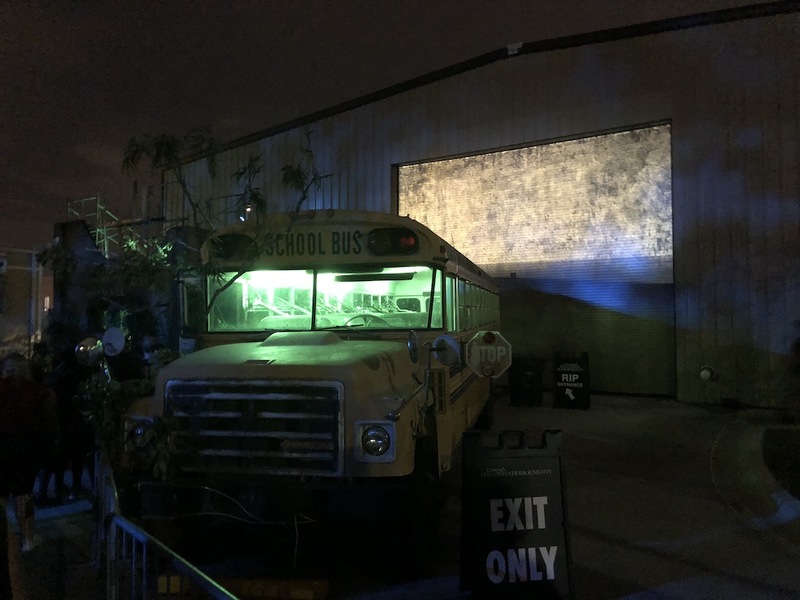 Another scare zone was called Vamp 1985. In this area about every 20-30 minutes the ball drops to celebrate New Years eve. The only problem is that when the ball drops the vampires storm into the crowd looking for victims. Up next we visited another original house called Scary Tales. This was my favorite house we visit this night. By this time it was around 10pm and the lines for the houses were getting pretty crazy. The line for this house was posted as being 35 minutes but I’m pretty sure we waited at least 50 minutes, but it was worth it. The story behind this house is that the Wicked Witch of the West has cursed the land of the fairies, twisting beloved stories beyond recognition. This just means that all your favorite fairy tales have been turned into horror themed nightmares. One of the rooms was the witches house from Hansel and Gretel and there was an amazing smell of gingerbread as you walked through. 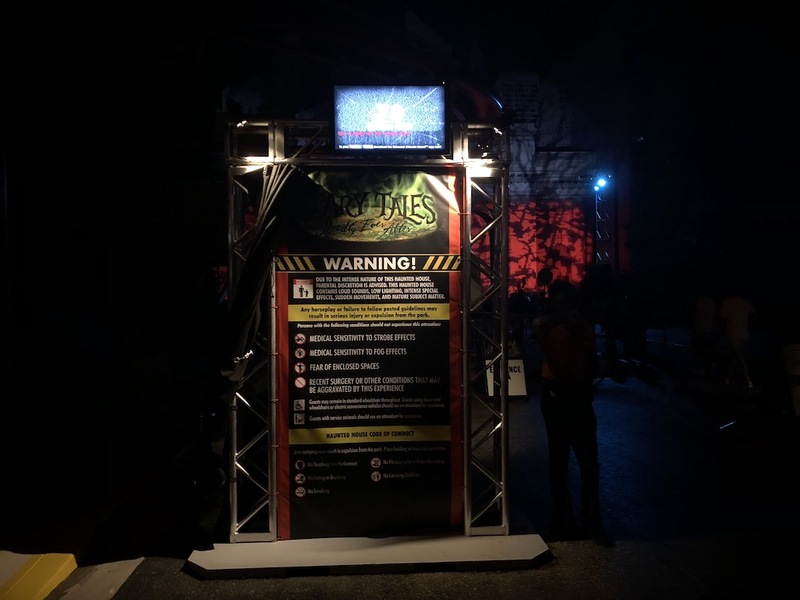 The scares in here were not too over the top, but the theming was really detailed and amazing. The Stranger Things house was definitely the longest one all night and it didn’t get much better. We checked the wait times for this house numerous times during the night and it was always around 60-90 minute wait which was just too long for us. 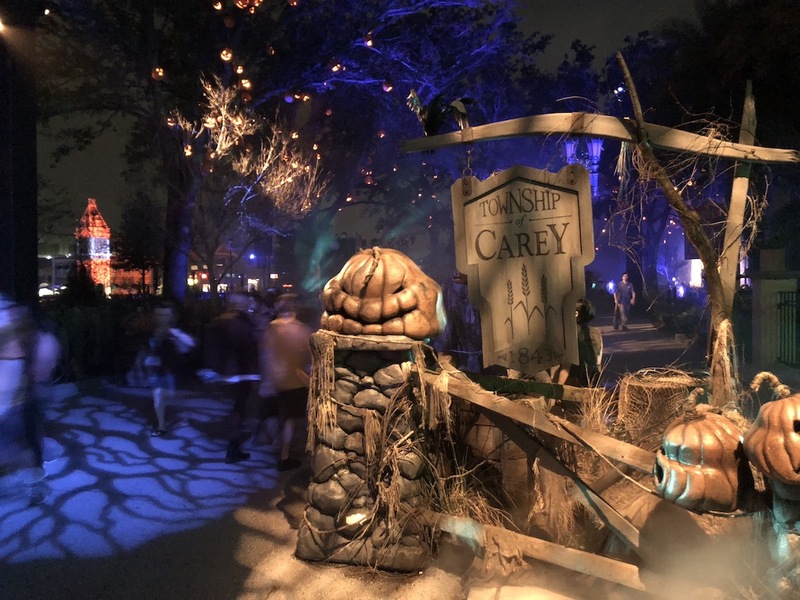 One of the last scare zones we headed through was called Twisted Traditions. The description was that an ancient evil had reawakened and transformed Halloween into an abomination. There were a lot of scary pumpkins, and things handling from trees along this path. Plus lots of creatures jumping out to see why we were walking through. 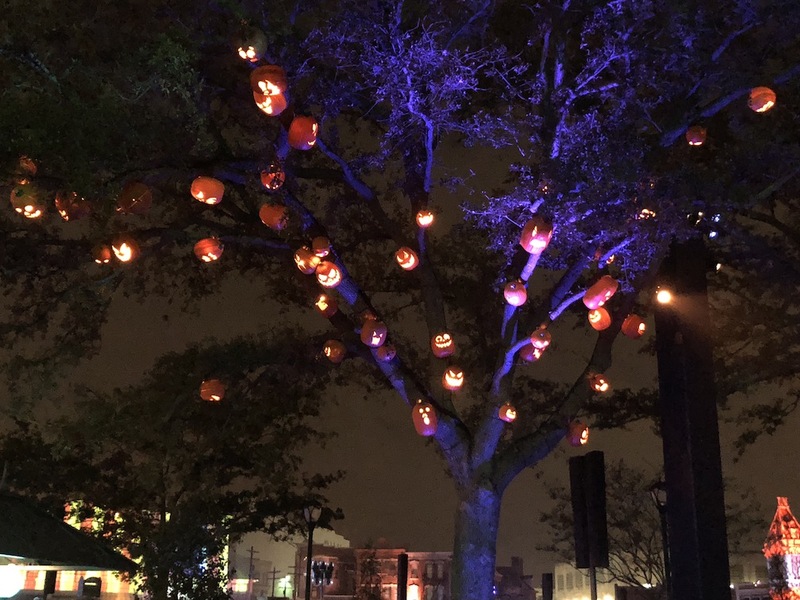 One of the coolest features of this zone were all the lit pumpkins decorating the tree tops. 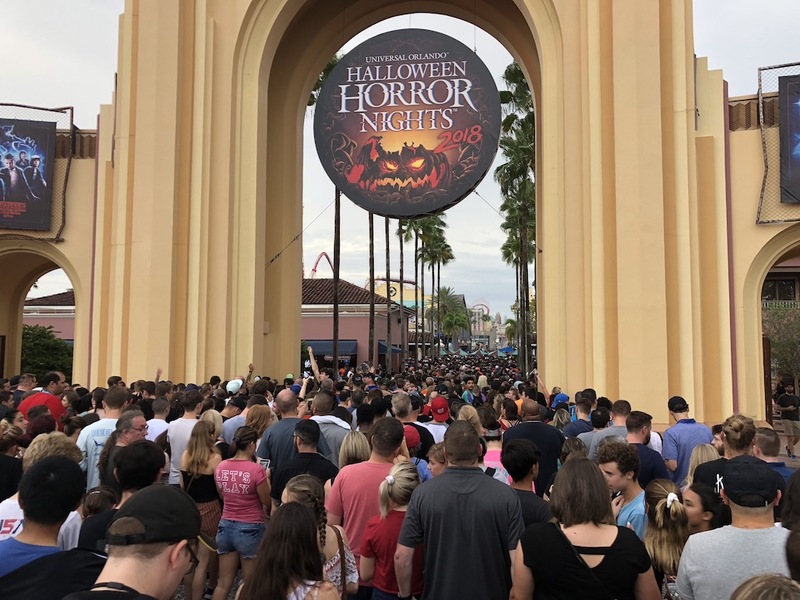 The HHN night we visited was on a Wednesday. We chose that day as it was supposed to be a lower attendance day, but as you can see from the wait times above it was still pretty busy. We ended up getting into four houses out of ten that are available, and all the scare zones. If we can figure out how to visit again before these events are done for the season we will definitely be back. The houses were amazing, the scare actors were fantastic and it was just a lot of fun. The night would go on until 2am but we headed out around midnight since we had work the next day. 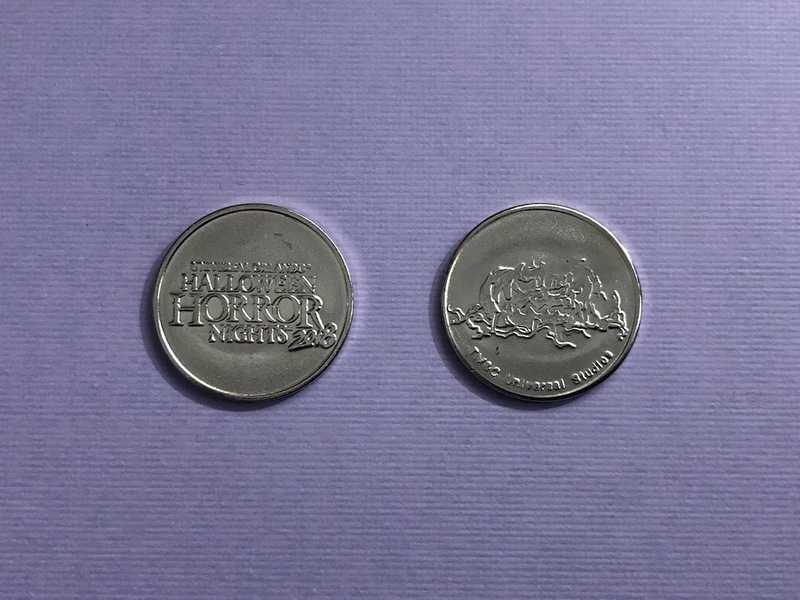 The souvenir tokens were a very nice surprise and will make a nice addition to my collection. Hopefully this is something they will continue doing annually. We are definitely going to visit again next year and this would be a fun little souvenir to get year after year.